through to construction sites and on the surface on the ocean. at Hivix　our thinking is that we have an urgent obligation to push the quality of our products to the very limit. "“ETC barrier arms made from air?” Learn more about barrier arms that cause minimal damage in collisions and are easy to repair and maintain. Read the secret story of how we developed the product together with manufacturers through many years of trial and error. Through the techniques of high-frequency welding and heat-welding we are constantly striving to make products of the highest quality. Hivix is a plastic products manufacturer specializing in making inflated air products through the processes of high-frequency welding and heat welding. Hivix Co. Ltd began in 1951 as a manufacturer of plastic products. Through our manufacture of water rings, boats and other leisure products and our export activities, we improved our technical abilities and we have now shifted focus to products with higher added value. 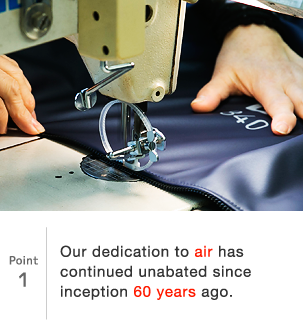 Despite the changing fashions of the world and throughout transitions in the company, from our founder we have inherited the conviction that taking care of the core business is of primary importance. That is why we lavish so much care and attention on our “inflated air” products. The accumulation of over sixty years of knowledge, technology and achievement has given birth to the modern Hivix, a company that “leads the way and defers to none in the supply of high-quality products that solve the many and diverse needs of our customers. 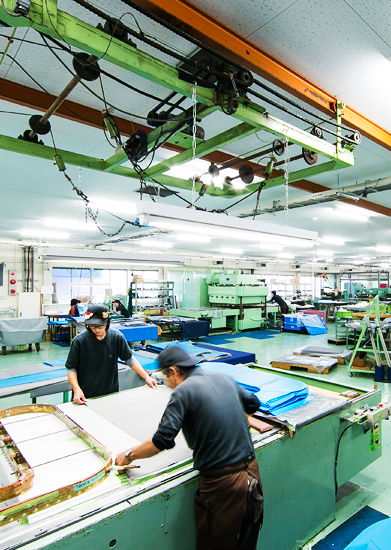 In order to maintain the highest quality, we have integrated all our operations, from development to production, at our factory here in Japan. As it means that we are able to provide a fully linked up system, from consultation with the customer, to the development of prototypes and on through to mass production and distribution of goods, we are fully committed to domestic production. We did at one time try producing our goods in China, but as high-frequency welding and heat welding require such a high level of skill and technique, quality became variable. 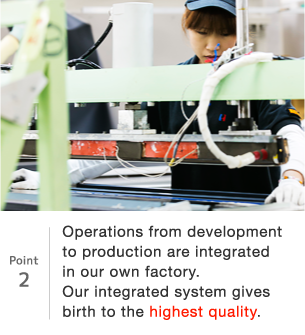 As a result, in order to best combine the maintenance of real high quality with efficiency and cost concerns, we arrived at the decision to integrate operations at our factory here in Japan. 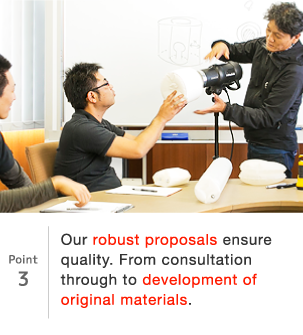 Our strength in creating robust proposals that utilize inflatable air products leads us to solutions to customer’s problems. Heat-welding and high-frequency welding processing is not just a matter of manufacturing, but also incorporates the ability to generate robust proposals and this is one of our strengths at Hivix. By working with our manufacturer customers right from the conceptual phase of a product, we bring the skills and knowledge fostered over many long years together to create various different proposals. Our style is to work together with our customers to come up with the most suitable materials for their product, or if necessary to work with other manufacturers to develop better materials, and to freely apply our knowledge and welding skills to commercialize our customer’s ideas. One of our original products is High-board. Regular air mats, made with PVC for example, tend to take on a rounded shape due to pressure from the air used to inflate them. However when a High-board air mat is inflated, it retains a flat shape. Because rigidity is maintained even under pressure, High-board has garnered attention for a number of applications. The raw materials used to construct High-board consist of a fabric outer, strong and durable both inside and out, within which tough fibers are woven. In order to ensure the product is airtight, every surface is coated many times over. High-board is used for formwork in construction and in the manufacture of small pools, and is one of our leading products. In order that we can work in this way to find solutions to all of our customer’s problems, we blend our expertise in high-frequency welding and heat-welding processes with strict quality control to create new proposals. Copyright© 2019 HIVIX.CO.,LTD of high frequency welder processing and heat welding processing. All Rights Reserved.